1. Coast as much as possible. Look ahead for any stops or slow downs in traffic coming up and immediately take your foot off the accelerator. The more constant you keep your speed the better your mileage. 2. Keep your speed below 55 mph. For every 5 miles you drive above 55 you lose about 10% of your fuel economy. 3. Avoid routes with lots of traffic and stop signs/stop lights. A longer route with fewer stops may be more fuel efficient. 4. If your job has flexible hours try going in earlier or later to avoid traffic. 5. Change your oil every 3000 miles. 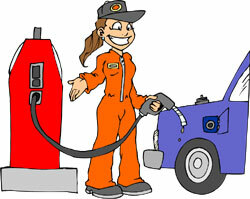 Newer oil is thinner and gets pushed through the engine easier, thus increasing fuel mileage. 6. If idling for more than a minute turn off your engine.